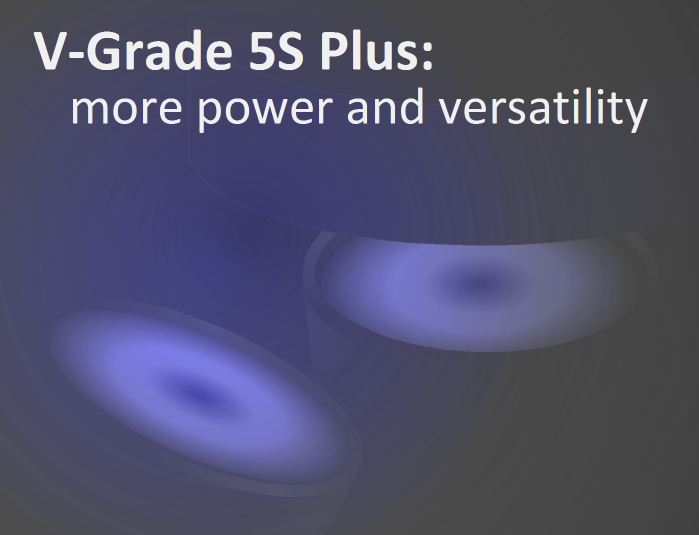 Tin Model LLC proudly announces the release of V-Grade 5S Plus -- a suite of PVD modeling tools with a focus on sputtered thin films. V-Grade 5S Plus expands the realm of PVD modeling by including physical phenomena such as plasma-substrate interaction and non-unity sticking of vapor particles. Also new in V-Grade 5S Plus are modeling of linear substrate motion and an advanced thickness control technique: modulated transit. The computation speed of V-Grade 5S Plus is nearly tripled from our previous releases. Bombardment of thin-film surfaces by energetic species (high-velocity neutrals, ions and electrons) is present in nearly all sputter-deposition processes with magnetron sources. Sputter-deposited thin film materials often owe their desirable properties, i.e. density, hardness and crystallinity, to the bombardment. Some unbalanced magnetrons and High Power Impulse Magnetron Sputtering (HiPIMS) are specifically designed to harness the benefits of the bombardment. Quantifying the effects of such bombardment is usually difficult, especially when a complex geometry is involved. With V-Grade 5S Plus you can quantify these effects through the corrections they cause (which may be subtle in some cases) to film thickness distribution and to absolute thickness values. ​V-Grade 5S is constructed on the same platform as our previous releases. It's inherently versatile -- it can seamlessly handle vapor sources of various types and geometries, substrates from flats to arbitrary 3D surfaces, multiple shadow masks of arbitrary shapes and polarity. Its vapor-plume fitting function allows users to determine the plume function of a source from experimental data. With V-Grade 5S Plus, you can predict the outcomes of PVD processes to ever greater accuracy. You will be able to optimize your processes with high efficiency and effectiveness. You can improve the quality of your products and maximize the yield of production. You can quickly prove your new concepts for thin-film manufacturing. All these are now possible through dispensing some computer time and mouse clicks. Please visit Tin Model website www.tinmodel.com for more information, or requesting an upgrade or trial.